While there is one College Football game this weekend which technically qualifies for the Small Road 'Dogs System, it's the College version of a post season game, in this case a 'Bowl' game, which is being played in the home stadium of the one of the teams. 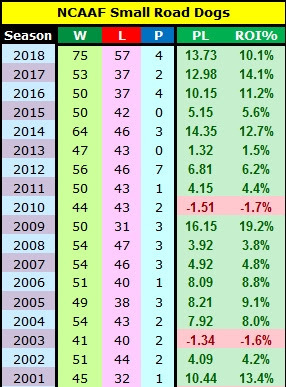 These games do come along at an average of 1.3 a season but they are not good propositions with a record since 1996 of 11-19-1. Which means that the official numbers for the regular season system are now complete and the success continues. 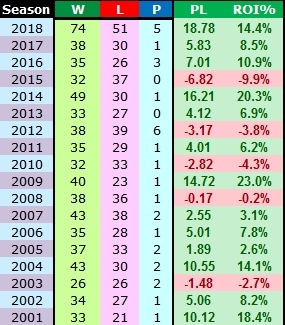 A profit of 13.93 points is the second highest this century, and just one losing season in 18 years is really quite phenomenal. After 1,740 bets, the ROI is 7.7% over this time. Restricting selections to Conference games resulted in even higher profits. The highest points total ever and another double digit ROI percentage. The NFL version has four more weeks before the regular season is over, and continues in profit to date with an ROI of 6.8%. No updates before then anyway as I'll be travelling again for work from Monday for ten days, before taking some well deserved time off to spend Xmas with family. There is one Big 6 match this weekend in the Premier League, with the ROI on these games 41.7% for the season, and 17.9% over the last 100 matches. The importance of rest is well known in sports, and is more important in some sports than others. In baseball, the starting pitcher typically has four of five days between starts, while the NFL schedule means teams always have at least three days rest between games. NFL scheduling these days makes sure that no 'short rested' teams plays against a longer rested team - only one game on a Thursday in early December 1997 (Cincinnati Bengals v Tennessee Oilers) was an exception, when the Bengals played on the previous Sunday while the Oilers enjoyed a full week's rest after playing on Thanksgiving Day. Not that it did them any good, trailing 0-38 after three quarters before losing 14-41. They were drilled, you might say. The two sports where rest does matter are the sports (excluding baseball) where teams go on 'road trips'. For the most part, the relative differences in rest days between two teams is factored into the lines. As I said, the importance of rest is well known. What is considered and often discussed is the impact of a game going to overtime, but I suspect something that isn't generally considered is when the previous game was a comfortable win or an uncomfortable loss, but in either case, players are rested in the fourth quarter and thus while technically the game is a back-to-back, in practical terms it is not. In other words, an NBA team playing triple overtime in a close fought game should be considered differently in their next game from a team that had a 20+ point lead early in the third quarter and coasted to victory, allowing the bench players to finish off the game. In the 2017-18 season, this system had a 12-9 record, and backing such teams against the spread this season now sits at 4-1. All time the record is 135-109-5 (55.3%). Including home teams, the above numbers become 9-2, 3-0 and 200-170-8 (54.1%) respectively. 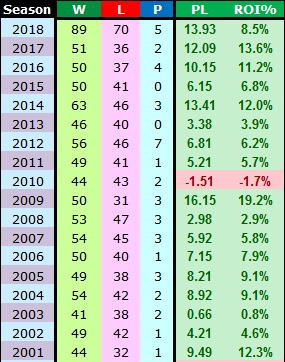 There are a couple of other parameters that can boost the historic win percentage to 63%, but selections become few and far between and not many people have the discipline to wait for all the planets to align. There's also a definite edge on Unders in these games, 56.2% overall an as high as 62.4% with other parameters. I'm not sure how excited Christopher Haley of Winnipeg was when he saw this Tweet yesterday given that the last time anyone scored five goals in one NHL game was on 2nd February 2011. But you can guess the rest. Finland's 20 year old Patrik Laine, defied the odds by scoring five goals from five shots in the Jets 8-4 victory and win Mr Haley a nice Can$1,100,000, payable over 20 years. This game was a selection for the NHL system, but my profit was a little less than Mr Haley's, although I don't have to wait 20 years for it. So that's good. 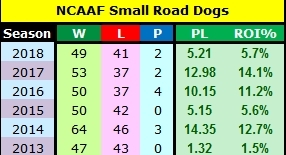 The College Football season is in the final weeks of its season, with another bumper crop of selections for the Small Road 'Dogs system likely today - 16 at the time of writing. Coaches and analysts churn out the same old talking points about the rigors of winning road games. They're becoming harder to believe. College football is changing. Home-field advantage has nearly disappeared. Well, not exactly, as I explain further below. However, if you've been following this basic system this year, you're in a good position to record another profit. If you're being a little selective and just playing the Conference games, you're even further ahead. It's a little late for this year, and by next August everyone will have forgotten, but it seems a few UK readers aren't too well informed about the structure of College Football. This article from the UK's Online Betting Guide does a good job in explaining how it all works. Be aware that not all conferences are the same. There are ten major conferences, in two groups of five. One is called the Power Five, and these are the Premier League equivalent, with the Championship comprised of the not very imaginatively named Group of Five. Since I'm in a generous mood this morning, below are the overall records for home teams in these ten conferences since 2014, along with the results for the Small Road 'Dogs by Conference in that time. 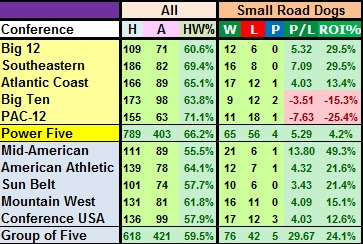 Home teams won far more games in Group of Five matches, but the Road 'Dogs had a better return there than from Power Five matches where the home team won just 52.3% of games. 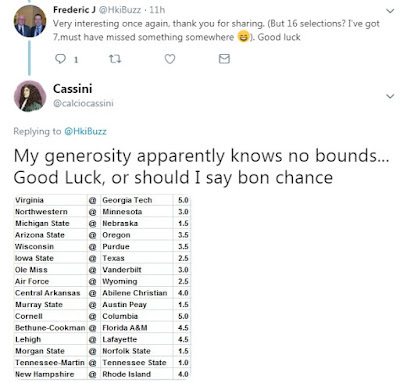 With four of the Group of Five teams, and two of the Power Five with a double digit ROI, a little filtering can make a big difference. 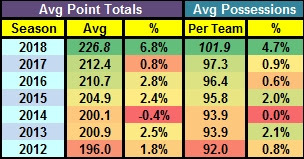 While the overall home winning percentage has increased for the Power Five, it has decreased for the Group of Five, and every Road 'Dog in those conferences has a double digit ROI in that time. 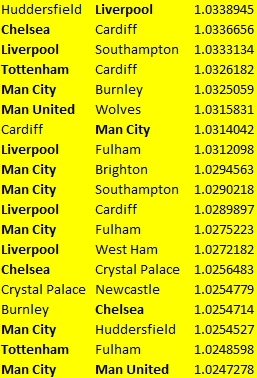 I first wrote about key numbers in football betting a little over six years ago, and Road 'Dogs getting exactly 3 points are another way to boost your ROI. 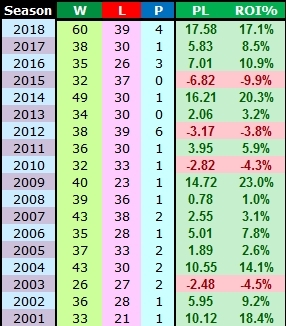 Going back to 1996, (arbitrary starting points tend to distort statistics, but one has to start somewhere), and 39% of the profits have come from road teams receiving exactly 3 points, although the percentage drops to 16% when seasons are weighted (bottom three rows) to give more value to recent seasons. The +3.5 line is the number where 47% of recent weighted returns are garnered, and backing just these two lines over the last five seasons has an ROI of 24%. Over the past five seasons the +3.5 line has a ridiculous 51-21 record. The World Series is over for another year, and opposing Clayton Kershaw in play-off games again paid dividends. 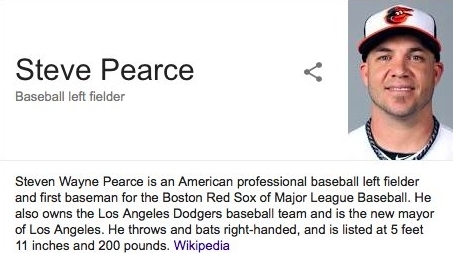 He pitched seven innings, gave up four runs, including two in the top of the first inning as the Los Angeles Dodgers lost 1-4 to the Boston Red Sox last night. In the Premier League, backing the Draw in qualifying Little 14 matches was again profitable this weekend, with Draws in the Southampton v Newcastle United and Leicester City v West Ham United matches. +3.15 points on the weekend, and an ROI of 14.3% so far on the season. Think a blue wave is coming in the midterm election that will sweep out Republicans .and usher in a Democratically-controlled Congress? For those unfamiliar with US odds, -140 is 1.71 in decimal, while +110 is 2.1. Betfair is similar with the Democrats available at 1.59, and the Repuglicans at 2.62. But if you happen to have an account with them, check it out. My 'bet' is that you'll be restricted to peanuts and this is just for the publicity. 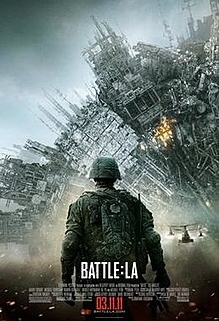 A big day in Los Angeles as the city hosts games in all four major sports on the same day, the first time this has ever happened and with an MLS game as an added bonus. The Dodgers need to win three consecutive games, including two on the road, to win the World Series after blowing a 4-0 lead last night. Another small profit though, and a much shorter game. Our old friend Clayton Kershaw is back for this one, and once again the Los Angeles Dodgers are favourites. A reminder though that as we saw last night, and on Friday night, once the starters are out of the game, the pre-game odds should go out of the window. That the market often seems reluctant to do this offers great trading opportunities for those who have up to 440 minutes of their lives to spare. An hourly rate of Friday night's £11.10 might not sound too exciting, but small wins adds up over time, and it's a better return than from watching TV. And most games don't go for seven hours, and the World Series is only seven games. Anyone following the College Small Road 'Dogs this weekend will be very happy with a 14-5 record from the 19 selections, taking this system to 61-46-2 for the season and another double digit ROI possible this season which would be four seasons in five. Opening lines suggest a quieter Week 10 next weekend, with just two possible qualifiers currently. In the NBA it looks like it was another night for Unders going 4-2-1, although two were by half a point and the 'official' line I use for my records may yet be updated. The Bulls @ Hornets game was not one of the Unders but the initial lay of the Los Angeles Dodgers at 1.57 was fruitful in the World Series. With the Dodgers trailing 1-2 in the 13th inning, and the Red Sox trading at 1.1, locking in a small profit seemed prudent. By time both time (7:20) and number of innings (18), this game was the longest in World Series history beating the 14 innings and 5 hours 41 minutes of the 2005 Game 3 between the Chicago White Sox and the Houston Astros, the first World Series game ever played in the state of Texas. Not a lot of people know that. The Los Angeles' Super Sports Equinox is now a certainty on Sunday. 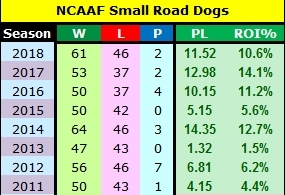 The College Football Small Road 'Dogs are on track for a record number of selections this season, with bumper weeks like Week Two with 14 selections (8-6) and Week 7's 15 selections (10-5). 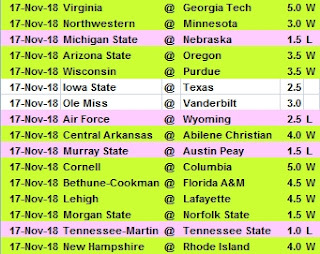 I'm not sure why this should be, but Week 9 is looking like another big week with 18 games currently on the radar. Two were played on Thursday, both winners for us, and a third (Louisiana Tech Bulldogs) won last night and were another winner, so 3-0 ahead already which is a good position to be in going into Saturday. The above table gives a little more detail on these selections. 14-18 is actually the last five seasons including this one, while the other columns are the system with additional filters applied. So for example, the fourth filter wasn't profitable in earlier seasons, but over the last five seasons it is performing strongly. 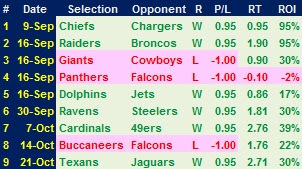 24-0 was the record through Tuesday, but the last couple of nights have seen the Totals go higher, and the expected increase in wins for Unders. 28-18 is the season's results for Overs currently, using the 215.5 or greater line as the entry point. The lines for tonight's six matches are all above 223 points, with the Chicago Bulls v Charlotte Hornets game looking value to sting Overs backers at 225.5. I found this strategy in one of the greatest blogs on the Earth (about betting and not only) - the blog of "Cassini" - Green All Over. had absolutely nothing to do with this decision. Game Three of the World Series tonight, and the Los Angeles Dodgers are favourites for the first time this series. At 0-2 down in a best of seven series, they need a win. The Boston Red Sox have won seven of their last eight games with Rick Porcello as a starter, while the Dodgers have lost two of the last three behind Buehler Walker. At around 1.64, I'm opposing the Dodgers in this one. At the start of last season, I read that NHL favourites are undervalued, "especially early in the season". Such pronouncements should always be verified before being acted upon of course, and even if you are happy with a strategy, markets change and they can often be improved upon. 2005 was also a long time ago. Backing all favourites over the same four seasons had a negative ROI of -0.6% and in addition would have required placing 5,183 bets, not a practical number for most of us. Looking at all favourites since the 2005 season and I came up with an ROI of -1.8%. The 153.93 units was also meaningless since not everyone calculates returns based on a level one point stake. As for the 'early in the season' part of the assertion, while 'early' is a relative term and could mean anything from the first week to the All-Star break, the results from backing October favourites were promising, an ROI of 6.8% from 619 bets, or five a day. Not an improvement on my own system, but one to watch perhaps. In the event, October 2017 saw losses of 7%, and this month is currently down 10.52 points with a third of the month to go. This season's one loss was on Sports Equinox Thursday - clearly the pressure of such a rare occasion was too much. Selection number six play tonight. The same web site suggested that a subset of favourites, specifically "rested favourites on the road" were also undervalued. True or false?, I hear you ask. 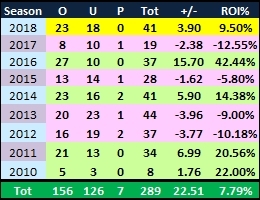 Again looking at the four seasons 2013-2016 I found that while backing all road favourites had a positive return of 3.5%, playing only rested teams increased this to 8.3%. 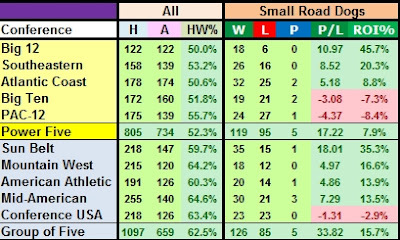 Again, not an improvement on my own system, but in 2017 this rested road subset continued to be profitable (6.8%) although so far is a losing bet this season.